As a young athlete, when injuries occur they can usually set you back a few weeks in terms of progress. Whether it is a new move you were starting to understand or a line that you nearly have close to perfection, it can be frustrating having to stop progress because of an injury that may or may not has been your own doing. During these times of injury, the simple solution is usually always rest, compression, and maybe even a little stretching and elevation. One of the most common injuries experienced in parkour is the rolled ankle. A rolled ankle is otherwise known as a sprain, which occurs when you overstrain the ligaments in your foot to the point where they are stretched or even torn. Practitioners are likely to come across this type of injury during precisions or landing that normally place heavy pressure on the ankle. When it comes to injury prevention, one essential thing that is often overlooked is simply stretching, and properly warming up before you train. It’s always important to understand proper landing techniques in regards to how to absorb impact and land properly beforehand, lest things get improvisational midair, and more than likely sufficiently more painful. However, in the case, this information arrives too late, worry not, for there are a wide variety of conventional treatments that can get you “back on your feet” in no time. As stated before, fresh, vulnerable injuries need rest to heal, and hopping on them too early can extend the healing time or even make the injury worse. Wrapping the injury can help reinforce the ankle for temporary mobility. Once the pain subsides enough, toe raises and heel-and-toe walking can help rehabilitate the injury back into working order faster. There are three common ligaments often involved in a ‘sprained’ ankle: the Posterior Talofibular Ligament, the Anterior Talofibular Ligament, and the Calcaneofibular Ligament. Specifically, when one of these ligaments is pulled too far, or even pulled to the point where they have tearing, or just straight up snap, this is the cause of a sprained ankle. 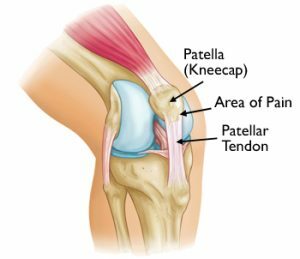 A ‘jumpers knee’ is caused by an inflamed Patellar tendon, the front tendon connecting your Patella and Tibia bones, this can be caused by hard landings, takeoffs, and changes in directions frequently, and is common in many sports. When it comes to wrists, the Palmar carpal ligament is most often the culprit, often caused by too much stress from shocking impact, or if twisted at an abnormal angle while any force is applied. Jumper’s Knee (also known as patella tendonitis) is an overuse injury that you may come in contact with if too much work is focused on the knee. As you’d probably be able to tell, jumping and running are often the reported causes of this injury. The pain, in this case, is caused by the overuse of the tendon that connects the kneecap to the shin bone, resulting in tearing. While overuse is mainly known as a perpetrator of this injury, improper technique is also known to be just as reliable a cause. Knowing your limits is a healthy mindset to keep in order to avoid Jumper’s Knee altogether. Pressing yourself too hard too often will wear out more than your knees after a certain point. As far as treatment goes, rest is still the way to go, and keeping the injury elevated doesn’t hurt either. Quadricep stretches should help with rehabilitation and keep stress off of the healing tendon. Finally, the last heavy hitter we have is general wrist strain. As useful as the hands are, they’re based upon the weak and feeble wrists. The wrists are similar to the ankles in the way of functionality, but when it comes to how much pressure they can take, they fall significantly short. Strengthening the surrounding forearm muscles and ensuring proper technique when in use is a good way to keep the wrists themselves from taking too much strain when in action. However, tread very lightly if an injury does happen to occur, as the wrist is relatively fragile even in a healthy state, and the deeper an injury is worked, the more catastrophic and long lasting the results may become. Treatment, as always involves a proper combination of downtime and rehabilitation exercise; this time with wrist rotations, fist clenches and finger extensions. Lastly, always keep in mind a doctor may be in the cards if you’re feeling uncertain. Overall, injury's are a common feature when it comes to any physical activity, but this does not mean that its occurrence should be overlooked, or its results neglected. It’s best to keep an eye on yourself and maintain proper conditioning and preventive measure to keep yourself well in the first place. However, mistakes do happen, and when they do, it’s just as important to stay cool and know what happened, what to do, and what comes next. Older PostWhat makes a good 'Parkour Shoe'?